To help identify specific adult learning needs, AASL’s implementation task force constructed character profiles or personas to represent different groups who share similar traits, beliefs, attitudes, and values with regard to school libraries. These personas were designed to cut across categories of stakeholders and unify them into fewer, but clearly defined, user groups that AASL wants to reach with the standards. While the personas created cannot accurately represent every future user of the standards, they are a useful tool for considering how the new standards will be used by real people in various contexts nationwide. By transforming the patterns found in AASL’s research into people with faces, backgrounds, and passionate questions of their own, AASL can keep the needs of stakeholders and users at the forefront when developing standards materials, resources, and professional development to support implementation. Consider using personas as you work with colleagues to identify user needs in your own communities. Personas can be a tangible reminder of the spectrum of the true target audience. 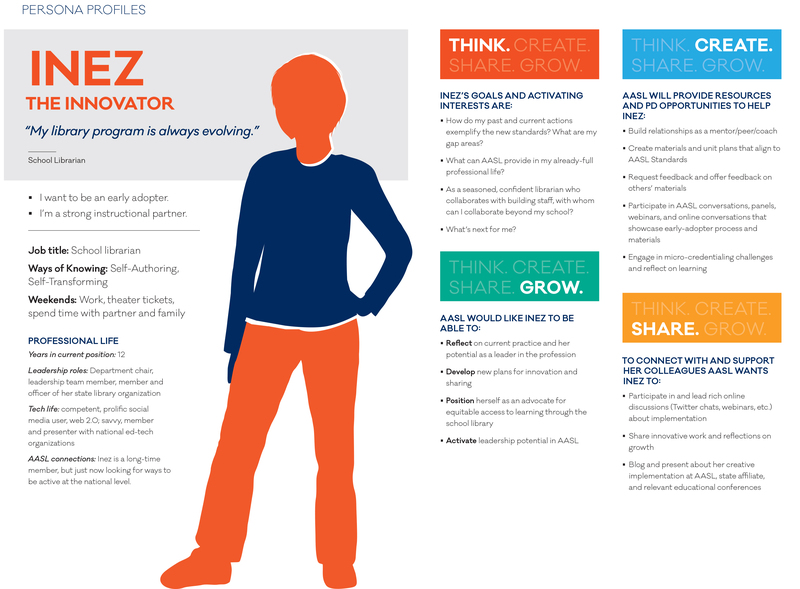 Adopt AASL’s personas as developed, or adapt them to fit your community as you explore how the new standards will be used in your organization. Need help crafting messages for your communications?